Traditional dulce de leche is simplicity at its best. It is a milk spread—or golden brown jam—that is made by preserving farm-fresh-milk with sugar in a very long cooking process similar to that of preserving fruits or making apple butter, except that raw milk does not need pectin to create its velvety texture. All that is required to make a small batch of artisanal dulce de leche is a humble four-ingredient beginning, a faithful stove, a strong arm, and time—a lot of it. Cow’s milk, sugar and not a whole lot else goes into the golden milk jam that grandma Dorita so often made throughout Josephine’s childhood. 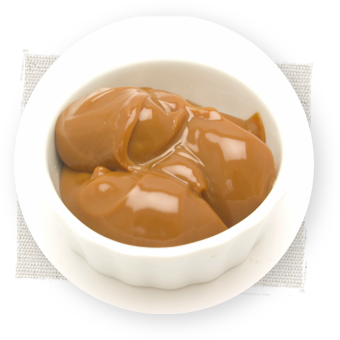 Whether its spread straight from the jar, added to roasted vegetables, baked into sweets or simply formed into confections, dulce de leche is a versatile ingredient that enables you to take a meal from ordinary to outstanding with minimal effort. Dulce de leche has been trending in the US specialty foods market for many years. It is a regular flavor in the Häagen-Dazs and Ben & Jerry’s ice cream flavor portfolio, and mixed into Starbuck’s Frappuccino’s with a squeeze bottle. Yet, while its flavor is highly desired, dulce de leche is still very misunderstood in our culture. Since launching our La Dorita, we have participated in several demo’s and food shows and sampled our products to hundreds of people. It’s from our conversations that we’ve come to realize that while consumers are intrigued with dulce de leche, they still don’t quite understand what it is, how to use it, or how to say it. The same is true for the buyers at the natural grocery chains. They question the proper aisle placement—whether it should be in the spreads sections by the apple and peanut butters, the international section, or the baking section? The answer? All of the above since there are many varieties and uses—from the tradicional or clásico, the del campo (from the countryside), the estilo colonial or criollo (Spanish or Creole-style), the con miel (with honey), the para tortas y postres or repostero (for cakes and desserts), to the dark chocolate-flavored spread and the heladero, used exclusively for making ice cream. In Argentina dulce de leche has its own dedicated aisle in the grocery store showcasing competing brands, consistencies, flavors and dietetic versions—similar to the peanut butter aisles in our own stores. There’s no denying that dulce de leche is a cultural phenomenon in Argentina; it is in most every household’s kitchen pantry, sits on every breakfast table, and is served in café’s for breakfast, high tea and dessert—in every which way and form. And, naturally, every region in Argentina claims to have the best version. Argentines even claim the birthright to dulce de leche, as they link its beginnings to the 19th Century Argentine caudillo (political leader) Juan Manuel de Rosas. As the story goes, on a winter afternoon at the Rosas’ house, the maid was making some lechada—a drink made with milk and sugar that’s boiled until it begins to caramelize—when she was distracted and left the lechada unattended on the stove. By the time she returned, the lechada was burnt and had turned into a brown jam: dulce de leche. One thing is for sure—dulce de leche is as popular today, as it was then. In the United States, dulce de leche is known by some, but for most it is something entirely new, to be purchased as a gourmet ingredient for that one specific recipe, or often mistaken as caramel. Even those familiar with the term “dulce de leche” often do not know the product in its purest form, as it has been popularized in mainstream culture as simply a type of ice cream or coffee shop flavor. We hope to clear up these misconceptions and get to the core of the versatility that dulce de leche brings to the table. In the United States, the flavor, and indeed, the jam itself, often is incorrectly described as “caramel” or relegated to an epicurean coffee-shop flavor. This is probably due to the FDA requirement that “milk caramel” appear on every label, because “milk jam” is somewhat ambiguous and not recognized in American food culture—not yet, at least. The truth is that dulce de leche has little in common with caramel, other than sharing its glorious golden color. Dulce de leche is a spreadable preserve that is made exclusively with natural ingredients. It does not contain butter or cream and often has half of the sugar and none of the high-fructose corn syrup that almost every caramel lists on its’ ingredients label. In fact, it often has less sugar than most of the jellies Americans put in their shopping carts each week. Dulce de leche can be virtually spread on anything and used as a complimentary ingredient in recipes throughout the day. You might even say it is a global, taste-bud doppelganger for the ever-popular chocolate hazelnut spreads that Italian’s incorporate into both sweet and savory dishes throughout the day. Simply put, dulce de leche is a no-frills, common sense, everyday ingredient. As a spread, dulce de leche can be a snack on its own, a snack with another snack, part of a meal or even an ingredient in cooking. It can be used any time of day and be paired with a growing list of flavors, such as sweet, savory, spicy, and ethnic flavor combinations—from pureeing with fresh fruits for homemade baby food, to baking in breakfast muffins, to cocktail-hour bacon-wrapped dulce jalapeños to alfajores and show-stopping layer cakes—dulce de leche is worthy of its own spot in the pantry—with no substitute acceptable.